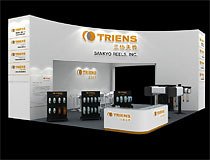 We will participate in "AMR 2012 Auto Maintenance & Repair - Beijing - "
We TRIENS Sankyo Reels, Inc. would like to thank you for your usual patronage. 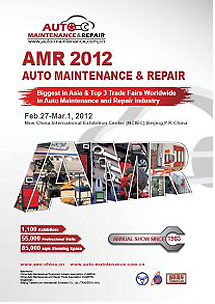 We are glad to inform you that we will participate in the auto maintenance show "AMR 2012 Auto maintenance and repair Beijing" this year. The "Auto Maintenance & Repair" is held every year, the biggest trade fair in Asia,　world Top 3 trade show in after market industry. Over 1100 enterprises will come join to this exciting show from all over the world, in a vast location of 85,000 square meters that stand in suburbs of Beijing. The organizer of the show is expecting over 55,000 visitors this year. When you look at the exhibitor's list or at the official web site, you might be astonished the variety of displaying enterprises. In addition to car wash, car care, and car testing tools industries, growing numbers of recycling and electronic ventures will participate in the show. As you may know at the end of the year 2011, the number of cars in China counted 106,000,000, and the number of private cars reached to 77,480,000. In Beijing, citizens regard it as a status to go to office by car and the numbers of private car reached to 4,720,000. Now it seems that the traffic jam became a big social problem in the capital. Beijing is showing amazing growth day by day. You can feel the obvious change of the city by visiting this world trade show. Please come visit the show, we will be honored to receive our customers in this big capital of China. 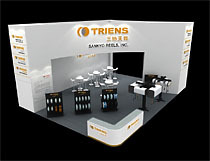 We all are looking forward to welcoming you at our booth.